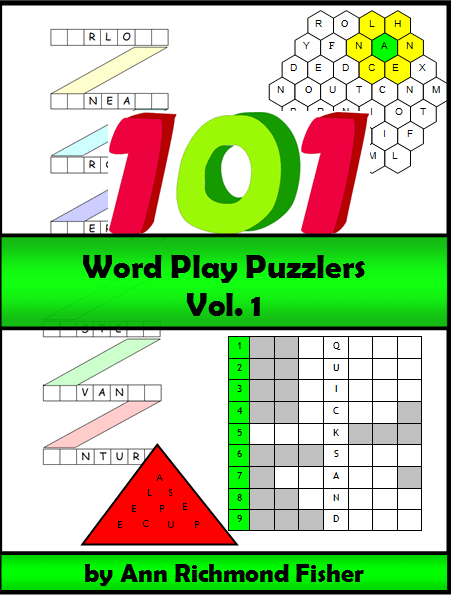 101 Word Play Puzzlers eBook : New Challenges for Word Play Fans! 101 Word Play Puzzlers contains a fascinating assortment of challenging, new formats that are sure to become your favorites. 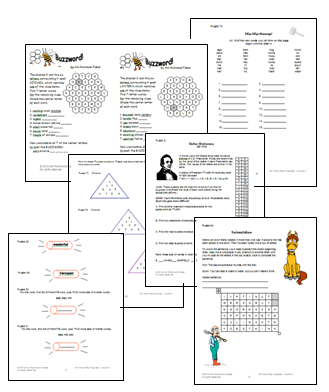 Whether you're a word play expert looking for fun puzzles to solve on your own, or you're a teacher looking for new challenging activities to build your students' vocabulary and spelling skills, you're sure to enjoy these puzzlers! What's Inside 101 Word Play Puzzlers? 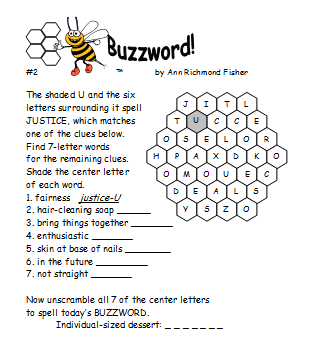 Buzzwords In this fun puzzle, you'll solve crossword-type clues by locating letters in a honeycomb shape and then rearranging those letters. You can try sample pages here. Trianagrams You'll score points by spelling four letter words that contain exactly one letter from each row in the triangle. You'll score even more if you can unscramble the ten letter word that uses all the letters in the triangle. Here's an example. Zigzags You'll have to complete the spellings of seven-letter words to make your way through each fun zigzag diagram. A great way to stretch vocabulary! Dynamites Can you solve these little games before your head explodes? Dollar Dictionary Solve puzzlers by adding the "value" of letters in words. Which words? You'll have to figure that out. You'll also have to know a bit of U.S Presidents to succeed on these challenging pages. HodgePodge An interesting assortment of quirky puzzlers. No two are alike! Some of the puzzles are solvable in just a few minutes. Others are full-page dilemmas that may take you much, much longer to complete. Puzzlers of about ages 12 and up should enjoy these word games. Download your free sample pages here. Buy now for $9.95 and download instantly! when you purchase this assortment of unique, challenging word play puzzles, I'll include a free set of FIVE FABULOUS crosswords and word search puzzles! These puzzles all have an interesting twist that will keep you busy for awhile! I've included cryptic crosswords and puzzles about both endangered animals and dangerous animals, and more. You can only get these puzzles when you purchase 101 Word Play Puzzlers, Vol. 1. You'll be ordering through Clickbank, a secure and reliable online retailer. Each product comes with a 60-day money back guarantee, so you can order with confidence! NOTE: This is a downloadable PDF file. It is not a hard copy book. 1. Click on the link in the yellow box. 2. Supply your payment info, either a credit card or PayPal info. 3. When your payment is confirmed, you'll be taken to a download page. Click on the download link, and save the file. 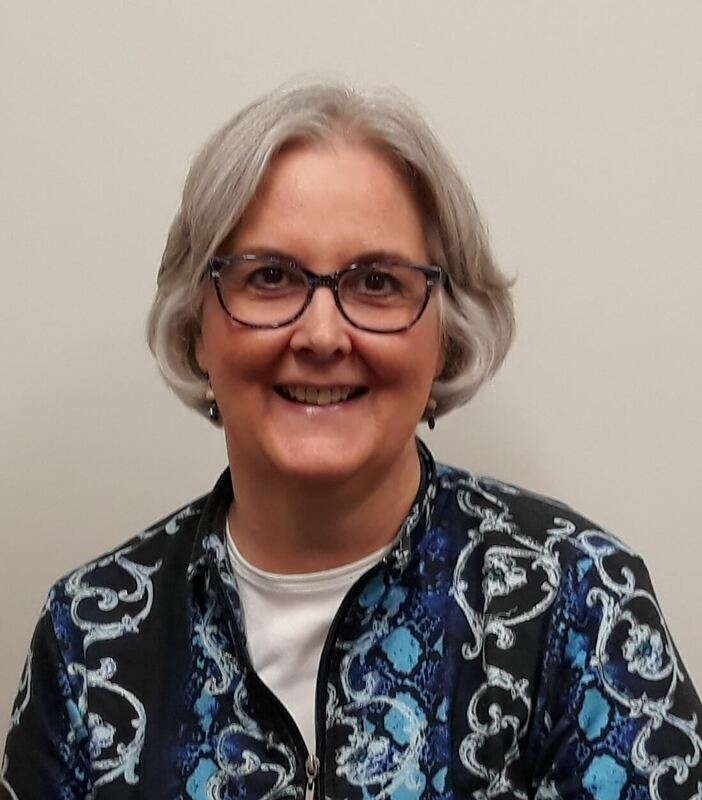 I'm Ann Richmond Fisher, longtime author, former classroom teacher, and owner of Spelling-Words-Well.com and Word-Game-World.com. For Product Support, Please Contact Me.